Let’s just say I have never had anything bad happen to me, being a Boston Sports fan would provide enough heartache & joy, triumphs & failures for one lifetime. I cried alongside my father as he watched the championship slip away with Buckner’s error in the ’86 World Series (pre internet), and I joyously rioted at UMASS Amherst when the Sox beat the Cards 4 games to none in historic World Series fashion, ending the 86 year long Bambino Curse (pre hashtag). This inevitable emotional tug of war is what being a sports fan is all about. In the past 4-5 years, however, the emotional tug of war for sports fans goes beyond wins and losses – particularly in the collegiate arena. Social media created a significant shift in the sports communications archetype; and NCAA regulations can barely keep up. 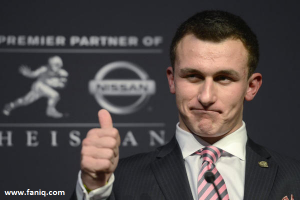 The relationship between fans and student-athletes has emerged to a new dimension. We are now just a click away from the latest #JohnnyFootball twitter drama. Understanding how damaging one bad tweet can be for a player or for the overall organization, Head Coach Butch Jones of the Tennessee Volunteers has put social media training as a priority for the upcoming season. And with good reason. A recent member survey conducted by CoSIDA found that 50% of athletic departments have had to remove a social media post from a student-athlete or coach in the past 12 months – 11% had done it more than ten times. Unsurprisingly, the study also uncovered that 70% of universities do NOT have a social media policies in place. Even the very subject of social media training can cause controversy. Last February, University of Michigan’s Athletic Director, Dave Brandon, came under heat as bloggers and even ESPN claimed that Michigan was “catfishing” their players to teach them lessons of social media. Oh, the tangled web of social media. • 57 of the respondents – 5% – said they have teams that are not allowed to use social media. 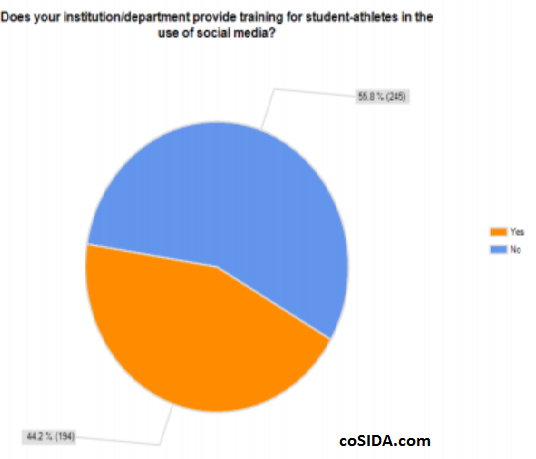 • The majority of athletic departments (almost 56%) do not provide training for student-athletes in the use of social media. • A little over half (55%) monitor their student-athletes on social media and the vast majority of the monitoring is being done by sports information directors and coaches. • Almost 70% do not have a social media policy for student-athletes. • Only 22% of schools provide social media training for coaches. As college football season approaches, I giddily await SportsCenter’s reporting of fantasticplays and hope for fewer stories of offensive tweets (link includes inappropriate language) from the players. To achieve this ratio, universities and athletic departments need not ban social media (or engage in suspicious training methods), but rather create a program that trains students to use social media appropriately and effectively. Let us give praise to the University of Washington’s #FeaturedAthlete program. UW’s approach includes an preliminary approval process, with a subsequent social media training course. Once athletes pass the course, the students are then allowed to use a branded “Husky” avatar which is featured on the website. 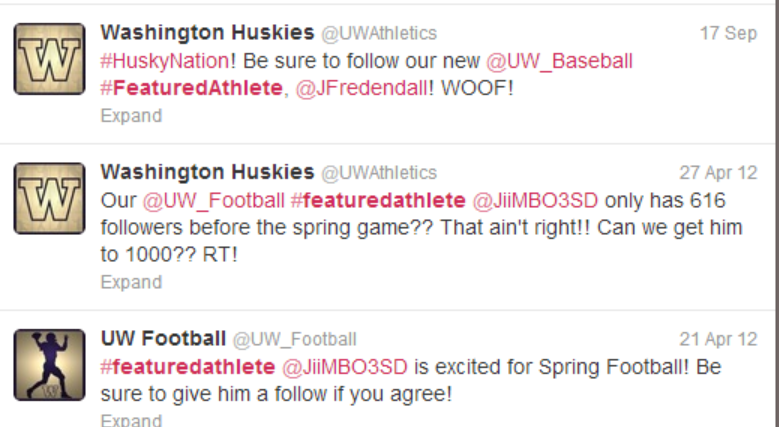 Additionally, the University uses the #FeaturedAthlete hashtag when the athletes are mentioned in press releases. Talk about a terrific incentive for students to get on board with social media guidelines. Positive motivations for adhering to social media policies is much more advantageous then fear of punishment. When utilized effectively, social media can be a huge opportunity for universities, athletic departments and student-athletes alike. Recruiting, branding, ticket sales, marketing, and even alumni donation – can all be positively impacted by a well-executed social media policy. Here’s hoping that with social media training, we, the fans, can get back to what being a sports fan is all about; absolutely losing our minds when plays like this happen. (However, that hit may be deemed illegal under new rules this year, but we will always have YouTube to relive it again and again).